When Clement Clarke Moore first began dividing his family’s estate, Chelsea, into building plots, he envisioned a high-end residential neighborhood on the land. Restrictive covenants were included in the deeds to ensure a higher class of home, and his original plots were unusually wide—averaging 25 feet but extending to 37 feet wide in a few cases. Stone merchant Bezaleel F. Smith branched out into real estate development and on April 25, 1835 purchased lots from Moore—stretching from No. 326 to 332 West 22nd Street. His speculative row was fully completed in 1841, designed in the popular Greek Revival style that was taking the city by storm. Among them was No. 326 which would become home to Samuel Down. Like its neighbors, the brick-faced home sat on a tall brownstone basement. The contrasting stone reappeared in the wide stoop, the sills and lintels, and the hefty entrance pilasters and entablature so familiar in the architectural style. Stylish iron stoop railings terminated at brownstone pedestals that, most likely, once supported ornate basket newels. In 2016 the elaborate stoop ironwork is missing, undergoing restoration. Samuel Down was an inventor and in 1857 received the Silver Medal from the American Institute of the City of New York for “the best dry gas meter.” Not long after his wife’s death in Boston, on Friday, September 18, 1861, Down remarried. By 1863 he had sold the house and he and his bride, Jane, moved to nearby No. 319 West 21st Street. It was briefly home to James G. and Isabel S. Chalmers. Tragedy visited the house on New Year’s Day 1863 when little James, Jr. died at the age of one year, seven months. Two days later, on Saturday afternoon the child’s funeral was held in the house. Within months Andrew Hanser soon moved into the 22nd Street home. The Civil War had raged for two years by now, and 1863 would see horror visit New York City. For three violent days in July New York City was terrorized by what became known as the Draft Riots. To augment troops fighting the Civil War, a new law had been enacted to draft men into the army. But corrupt practitioners focused on the working class—primarily Irish immigrants—while the wealthy bought their way out of service. What started as a protest against the draft quickly disintegrated into a bloody riot with mobs ransacking homes and businesses, murdering innocent blacks, and beating civilians caught on the streets. The neighborhood where Andrew Hanser now lived was, ironically, highly-Irish. But on Monday July 13 not only was he attacked, but his house and its stable were targeted as well. On August 9 The New York Times reported that two Irish immigrants, James Fitzherbert and Michael O’Brien, “stand charged with being engaged in the late riots.” It added that Andrew Hanser filed a complaint against the men for robbery and assault. With things significantly calmer the following year, the Hansers rented a room in the house for additional income. Edgar Abel Turrill of Montrose, Pennsylvania, lived here while studying at Columbia College in 1864. He was a junior that year. By the late 1870s educator Edgar Vanderbilt lived in the house. He earned his M.S. Degree at New York City College in 1866 and in 1878 was teaching in Grammar School No. 55 a few blocks away at No. 140 West 20th Street. Vanderbilt would rise to the position of Principal of the school within a few years. Vanderbilt was followed by the Hughes family in No. 326. Hughes widow, Catharine, sold it to Alphonse Montant and his wife, Eliza C. B. Montant, on September 27, 1887 for 15,500—just under $400,000 in today’s dollars. As was customary, the title was put in Eliza’s name. The couple soon set to work modernizing the outmoded residence by hiring architects Constable Bros. in August 1889 to add a 10-foot high mansard roof. 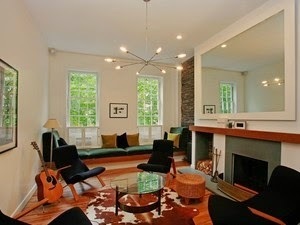 The fashionable addition cost Montant $2,000. Somewhat surprisingly, their updating stopped at the Second Empire style roof. The original Greek Revival elements—even the ironwork—of the main structure were left intact. By the turn of the century Alphonse had taken up photography as a hobby and was a member of the Camera Club. In 1900 he and Eliza began considering leaving No. 326 West 22nd Street, and their search for a new residence sparked Alphonse’s creative side. Bessie T. Siffert, who dealt in real estate, purchased No. 326 as her residence. While living here in 1912, for instance, she also owned a tenement building at No. 337 West 20th Street. In 1924 the house was purchased by Mrs. Mary J. Taggart. Like most of the once-grand homes on the block, she operated it as a rooming house. Mary Taggart retained ownership for three decades, selling it in 1954 to an investor. The house continued to be operated as a rooming house until 1972, when it was converted to apartments—two per floor. Although the elegant Victorian interiors have been lost; No. 326 is little changed since the Montants added the added the French roof in 1889. A copper Tudor style cap originally crowned the corner tower. In the early 1890s East 77th Street, between Madison and Park Avenues, was lined with narrow brownstone-fronted rowhouses. The 18-foot wide, three story house at No. 71, built in 1877, was now home to architect Alexander Bing, partner with his brother in Bing & Bing. But with the new century, the upscale tone of nearby Fifth Avenue spilled down the side streets and wealthy New Yorkers remodeled old townhouses into modern upscale residences. At the same time another trend was sweeping Manhattan—cooperative artists’ studio buildings. Throughout the city structures were being designed with artists in mind. Vast, double-height windows offered northern light for the studios; while comfortable living spaces often sat to the rear. In 1927 a group of investors joined the movement when they demolished the two brownstones and a carriage house at Nos. 69 through 73 East 77th Street, including the old Alexander Bing house. They hired the architectural firm of Caughey & Evans to design a ten-story apartment building on the site. In the 1920s an architectural rage swept the country, resulting in entire communities of quaint and romantic neo-Tudor cottages, apartment houses, and civic buildings. The Studio Building at No. 71 East 77th Street would follow the trend. The architects produced a charming concoction faced in variegated brick trimmed in limestone. The three-story base featured diamond-patterned brick diapering, square-headed drip moldings, and openings framed in stone quoins and inset quatrefoil panels. The upper floors followed the studio pattern, with double-height windows—with diamond panes—flanked by single-height residential spaces. A crenellated parapet and Tudor-capped corner tower completed the romantic design. The name of the new structure did not last long. Instead of artists—who may have been put off by the southern exposure rather than the sought-after northern light—moneyed businessmen and their families moved in. Like most of the higher-end apartment buildings on the East Side, The Studio Building quickly used only its address as its identifier. Among the first of the residents were wealthy widow Hildreth Sisson Riddle and her daughter, Elizabeth. Elizabeth, who had attended the private Wheeler School in Providence, was introduced to society in 1928. Shortly thereafter, on January 5, 1929, Hildreth announced her engagement to John Ashley Merriman. The wedding took place on June 8, 1929 at Laurimore, the summer estate of Elizabeth’s aunt and uncle. With her daughter gone on her honeymoon, Hildreth left the city as well. Two weeks after the ceremony, on July 25, she gave a “farewell luncheon” at the Casino in Central Park. Society columns noted that Hildreth was sailing on the Roma to Europe. The newlyweds made their home in Great Neck, Long Island; and it is probably no coincidence that upon her return from Europe in the spring of 1930 Hildreth “bought an English type house on Mitchell Drive in Kennilworth, Kings Point, Great Neck,” according to The Times on April 19. In the meantime, newspapers followed the comings and goings of other residents. In March 1929 Paul Marcy White returned from his honeymoon with his bride, the former Ann O’Gorman. Ann was the daughter of former New York Senator James Aloysius. O’Gorman. And on October 8, 1931 Victor and Emily House returned to their apartment here after summering in Europe. Victor was a partner in the law firm House, Hothusen & McCloskey and the couple kept newspaper columnists busy following their widespread and frequent travels—wintering in Hollywood, Florida and summering in Vermont in 1932, for instance. Between those trips, Emily took time to give birth to a daughter on Saturday, July 23 in the city. When at No. 71 the Houses continued their busy social schedule. In December that year they hosted a dinner for Mr. and Mrs. Lucien Courtois of Tours, France, for instance. On September 17, 1933 The New York Times reported that Victor and Emily had returned to No. 71 “from a motor trip through the White Mountains of Canada.” They would stay long enough for the birth of another daughter on June 27, the following year. Another highly-respected couple living at No. 71 East 77th Street were retired U.S. Navy Captain George Earl Gelm and his wife, the former Marjorie Hempstead Cook. Through her mother, Marjorie was descended from Sir Robert Hempstead, a founder of Hempstead, Long Island. The couple was married in 1898. George had also served as editor of The Naval Observer. He earned the Navy Cross, the Victory Medal with citations, and the campaign medals for service in the Spanish-American War and in the Philippines. Upon his retirement in 1928 the Gelms settled in New York. By the late 1930s Marjorie’s health was failing. After an extended illness she died on April 28, 1941. George Gelm remained in the apartment until his death on March 19, 1944. Of a less distinguished pedigree but equally moneyed was Gloria Mead, wife of prize fight manager Eddie Mead. Gloria held a New Year’s Eve party in 1941. Guests in Upper East Side New Year’s parties would be expected to arrive bedecked with diamonds, furs and expensive jewelry. Gloria’s party was no exception. It was interrupted by three gunmen who, after terrorizing the guests, made off with $25,000 in jewelry and apparel. Other distinguished residents included bachelor Dr. William Harris, a pioneer and specialist in radiology. His summer home was in Poundridge, New York. Through his travels in Europe in the 1920s, he learned the treatment of x-ray therapy for fighting cancer of the larynx and brought the process back to America. It became his specialty. Another esteemed physician in the building was Harvard Medical School-educated Dr. Lucius Albert. He was attending surgeon at the Metropolitan Hospital and Consulting Surgeon at the Northern Dispensary, as well as Assistant Professor of Surgery in the New York Post Graduate Medical School. The irregular configuration of the apartments is hinted at by the double-height diamond-paned studio windows and the smaller openings along the sides. The 60-year old was the victim of a bizarre accident on July 14, 1953 which nearly cost him his life. At around 8:20 that night, according to Verdery, he was passing by a window as he walked from the bedroom to another room, and simply fell out of it. The courtyard where he landed was below ground level, making his fell a full five stories. The Times said ‘He struck a metal guard rail, partially demolishing it, but his glasses were not broken.” Oliver Roosevelt did not fare as well as his glasses. Critically injured, he was taken to Roosevelt Hospital with severe body injuries. Throughout the rest of the century the apartment building would continue to house prominent residents. Theatrical and literary agent Mark Hanna lived here until his death on August 15, 1958. He had been the personal agent of Helen Hayes and throughout his career represented writers, actors and musicians such as John O’Hara, Benny Goodman, Gypsy Rose Lee, Eleanor Roosevelt, and Dorothy Kilgallen. Among the only artists—if not the only one—to live in the building constructed with artists in mind was the highly-acclaimed Hobart Nichols. His landscapes were acquired by many American collections, including the Metropolitan Museum of Art; and he was for a decade President of the National Academy of Design and of the Salmagundi Club from 1922 to 1924. He died in his apartment here on August 14, 1962 at the age of 93. Tucked away on a block which is an architectural cornucopia of dates and styles, No. 71 East 77th Street survives unchanged. When Sarah Lloyd Broome married wealthy merchant James Boggs she was already 31 years old. The couple moved into a fashionable home at No. 113 Chambers Street. During their 27-year marriage they would have seven children. The first three died in infancy; but the others survived, Mary Rebecca, John Broome, James Samuel, and Julia. Like most wealthy Manhattan families, they had a country estate, Chevilly, which they purchased in 1821. Two years later, in 1834, James Boggs died in the Chamber Street home of stomach ulcers. In 1836 Mary and Richard took their two infant daughters to Europe. There, on March 21, Richard Ray died suddenly. Mary had already received a substantial inheritance from her father, including $16,000 in cash (a little less than half a million in 2015 dollars). Now she inherited her husband’s properties, including buildings on Pearl Street, Water Street, Chambers Street, and 20 undeveloped lots between Eighth and Eleventh Avenues. Following Sarah Lloyd Broome Boggs death in 1849 in No. 113 Chambers Street, Mary Rebecca Ray inherited the family home. The property stretched through to Reade Street where the private stable stood. In 1857 Mary had the Chambers Street house and stables demolished and began work on a store and loft building. The resultant structure, completed in 1858, was similar to the other modern structures transforming the neighborhood. The matching Chambers Street and Reade Street facades were Italianate in style. Clad in stone above the store level, they featured mitered quoins; deep, shelf-like lintels on brackets; and cast iron cornices flanked by hefty console brackets. The tall ground floor on both sides was fronted in cast iron. The fluted columns and capitals were chosen from the catalog of foundry of Badger’s Architectural Iron Works. Most of the firms leasing in the building were related to the cutlery and hardware business. Among the hardware dealers were Graham & Haines, W. F. Shattuck & Co., the Livingston Horse Nail Company, and Marcus C. Hawley & Co. Cutlery merchants included Broch & Koch and the Electric Cutlery Company. Edward Phelan was the only surviving partner of W. F. Shattuck & Co. in 1876. He left the building at around 6:00 Wednesday evening, March 25, headed for his home in Brooklyn. But first he stopped at Sweeney’s Hotel at the corner of Chatham and Duane Streets to meet with his bookkeeper, P. S. Biglin. Phelan, described by friends as “a gentleman of spotless reputation,” never made it home that night; and the following day he did not appear at his office. At around 4:00 that afternoon a body was seen in the East River at the foot of Corlears Street. He was identified as Edward Phelan by the gold Masonic keystone that bore his name and the lodge and chapter to which he belonged. The New York Times reported “Suspicion that the deceased met with foul play is entertained by his friends, there being marks of violence on his face.” His missing pocketbook added to that theory. “As his affairs were in a prosperous condition, the idea that he committed suicide is scouted,” said the newspaper. By the late 1880s John H. Graham had taken control of Graham & Haines; renaming it John H. Graham & Co. The high esteem in which he was held among the hardware merchants was evidenced on August 6, 1889. That afternoon, during a “well-attended meeting of hardware men” in the Hardware Board of Trade he was unanimously nominated to represent “hardware and kindred trades” on Mayor Hugh J. Grant’s committee that would represent New York at the Paris World’s Exposition. In the building at the time was the Berkeley Arms Company, which employed John C. Smart at $50 a week. Smart lived with his wife, Amy, and teen-aged daughter, Madeline, in Harlem at No. 278 West 118th Street. His unhappy domestic relations would bring about unwanted publicity for his employer. In the summer of 1893 Smart stormed out of the 118th Street house and did not return. On August 5 he faced a judge after Amy sued him for “cruelty and abandonment.” Smart defended himself, saying “his wife’s temper and petty persecutions drove him from home.” To illustrate his point, he told of one occasion when she hid his dress suit from him, and that “neither coercion nor cajolery” could induce her to tell him where she hid it. Surprisingly, while the cast iron column capitals have been lost, interior shutters at the second floor survive. But John H. Graham & Co. would be the building’s most veteran tenant, remaining here until the early 1940s when it relocated to No. Duane Street. The vast array of items the company offered included not only bicycle accessories and hardware, but automobile accessories (like lamps), horse clippers, tea bells, ice skates, cherry stoners, and manure forks. In the 1920s the tenant list became more varied. The American Grinder Manufacturing Co.; hinge manufacturers Lawrence Brothers; and Riker-Spiegelmann & Co., were relatively new occupants. Ten days later, according to Virginia, Gibbons proposed marriage. When she declined, he proposed three or four more times until she finally accepted. Virginia told reporters later than she came from a respected and wealthy Baltimore family and had graduated from a college “which bears a high reputation.” Since childhood she had exhibited a talent for acting through society plays in Baltimore. She came to New York to begin her stage career “with her parents’ consent,” and had only been here a month before meeting Gibbons. Now, on November 22, 1921 The New York Times reported that Virginia, whose stage name was Jerry Dickens “has just learned that he has a wife.” The Tribune added that “She has suffered about $100,000 worth in consequence, she estimates.” That was amount of the suit she filed against her suitor. Gibbons’s unflattering publicity for ruining Virginia Lee Dickens’s reputation was nothing compared to the problems he encountered five months later. On April 20, 1922 he appeared before Judge Talley in General Sessions court to answer to charges of assault on a police officer. Patrolman James J. Shanley had attempted to arrest Gibbons. It ended with the officer suffering a broken jaw. “The policeman thinks he was hit with a jimmy,” explained The Evening World the following day. By the third quarter of the century the venerable loft buildings in Tribeca found new lives as galleries, cafes and shops. In 1991 the upper floors of No. 113 Chambers were converted to two spacious apartments per floor. Today the cast iron storefronts on both sides survive; although their once-elaborate capitals have broken off. Above, the nearly 150-year old stone facades are intact; relics of a time of significant change on Chambers Street. In 1900 retired banker Arthur T. J. Rice had lived in the 20-foot wide brownstone rowhouse at No. 109 East 79th Street for several years. Rice had been associated with the Broadway National Bank for 45 years, having joined the institution as a clerk at the age of 18. Hours later Frances Rice and their son, Arthur J. Rice, waited dinner for the banker. A knock on the door brought tragic news. At around 5:00 Arthur Rice had entered the ocean at Brighton Beach. He did not venture far out, staying within the life lines where the water was only about five feet deep. But a rogue wave smashed into Rice, dislodging his false teeth. He was knocked under the water. Beachgoers saw him go under; but thought he was simply “taking a duck.” When he did not emerge, rescuers flew into action. Unfortunately, they were too late. Arthur Rice’s false teeth had become lodged in his throat and he choked to death. Frances Rice remained in the aging house for about eight years. She sold it in December 1908 to Edith T. Martin; the Real Estate Record & Guide reporting “the buyer will erect an American basement dwelling on the lot.” Simultaneously, Edith’s sister, Alice Martin McCoon, purchased the identical house next door at No. 109. Two years earlier, on December 9, 1906, James Henry McCoon had died “very suddenly” of pneumonia in his home at No. 45 West 48th Street. Now Alice Martin McCoon and Edith Martin laid plans for side-by-side residences. The newspaper got the architectural style slightly wrong; it being in fact what today is accepted as French Renaissance. Alice moved into No. 109 with daughters Edith, Alice and Carolyn Frances. An apparently modern woman, she drove a Stearns motorcar in 1914. As the girls grew up and their introductions to society neared, Alice took them abroad. She was obviously planning a summer trip in May 1920 when she leased the house furnished to jeweler Pierre Cartier for the season. Edith Martin sometimes leased her home, as well. When millionaire Fulton Cutting, Jr. decided to relocate from Boston to New York City in 1919, he leased No. 111. A year later, on May 7, 1920, Edith renewed his lease. The McCoon women were active socially. In addition to the dinners and dances in the house for their debutante celebrations, the girls were involved in philanthropic causes. In 1922, for instance, Edith was chairman of the junior auxiliary of the Manhattanville Nursery Association. Living in the house with Alice and the girls were two servants. One of them, 33-year old butler Walter Carney, was not who he seemed. Arriving with unimpeachable references and a high-class demeanor, he was hired in 1925. But on May 2, 1926 The New York Times reported that he had made off with $900 in Alice’s jewelry. He had, it turned out, simply written the references himself. 1927 was an important year for the McCoon household when both Alice and Carolyn Frances became engaged. Following Carolyn’s wedding to Robert Thomas Stone in the Church of St. Ignatius Loyola on Park Avenue at 84th Street, on November 19, a wedding breakfast and reception followed in the 79th Street house. Alice Martin McCoon died at No. 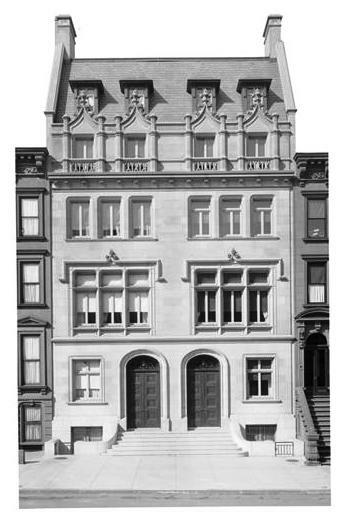 109 East 79th Street in 1930. Her $500,000 estate would top $7 million today. Six years later the McCoon house was converted to furnished rooms—as many as five per floor. Edith Martin’s home survived as a single-family residence until 1953, when it was converted to spacious apartments, two per floor. Three years later No. 109 was officially converted to apartments. In 1961 the Albert Landry Galleries moved into the lower floors of No. 111. The McCoon house (left) lost its fourth-floor balustrades, and throughout both is a mish-mash of replacement windows. During the apartment conversions, the shared stoop was lost and the entrances moved to below sidewalk level. Haunting, faded glory still shrouds the handsome townhouses where sisters lived side-by-side.